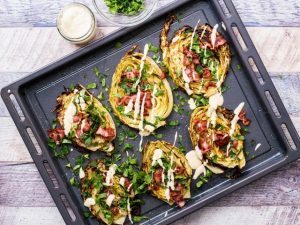 Roasted Cabbage Steaks: a crispy and tasty recipe very simple to prepare! If you want make a healthy meal but rich of flavor too, this is the right recipe. 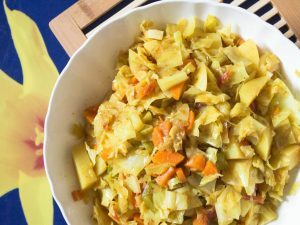 Ingredients: 1 heads of cabbage; 4 tbsp olive oil; 5 slices of bacon, cut into 1 inch slices; Salt and pepper to taste; chopped parsley. For the mayonnaise: 1 egg; 1 cup vegetable oil; tbsp lemon juice; salt; 1/2 tsp mustard. 1)Preheat oven to 200°C/390°F Place the cabbage on a chopping board. 2)Cut into slices 1/2 inch thick, trying to hold the leaves together. 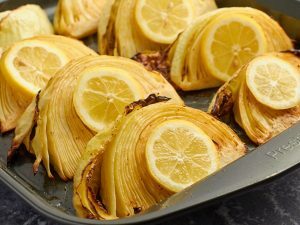 3)Put the cabbage on a baking sheet. 4)Drizzle with olive oil and sprinkle with salt and pepper. 5)Bake for 18 minutes, turn over, then roast for 18 minutes more. 6)Add the chopped bacon to the pan and cook until the bacon is crispy. 7)Beat the mayonnaise using blender.